edging the grass (not in anyone's estimation is it a lawn! 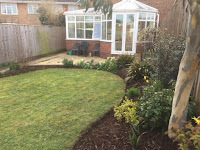 ), weeding and digging the borders and nearly crippling both Child 2 and my car by making them carry nigh-on a tonne of compost and bark in one sitting! Getting adventurous in the garden, hubby and I have started a patio at the back...it needs to be finished soon because I have bought a little greenhouse-shelf-construction for my seeds. Monty Don would be aghast to realise that I haven't got round to sowing any yet... salad and chillies might be a bit late in the Martin kitchen this year. With the wedding of the year later in August, I also made my first attempts at an outfit. I had great fun with two friends: one trying on hats (all a bit ludicrous to be honest!) and one buying a full regalia. And then the inevitable return of said full regalia as I reconsidered... just proving that I am, at heart, such as girl! Traumatised by the whole mother-of-the-bride pressure, I am resolved to give up for a few weeks before re-immersing myself in the High Street! Now other forms of real enjoyment have been the decadence of being brought a cuppa in bed in the morning and a subsequent hour's reading. That is the way to start every day! And further enjoying the freedom of not too many scheduled events, I have done some writing. That at least gave me some relief that I can put a sentence or two together for the gap-year-mid-life-crisis MA I'm doing in the autumn. The course is a year, but the book I have just finished reading took the author eleven years to write...that is real dedication to a story-line! In writing this review I am fully aware that I come very late to the The Goldfinch party. I have had it downloaded as an audio-book for months and had a couple of abortive listens to the opening chapter. Abortive, not because I didn't like it, but because I did and I needed to commit to listen regularly, rather than haphazardly between Radio 4 comedies and a premature penchant for The Archers Omnibus! So Easter baking gave rise to my third attempt at listening. It is a deceptively simple opening. Young Theo Decker is with his Mum on the way to a meeting with the school Principal. He doesn't quite know what is going to be discussed; his guilt spans several misdemeanours and the reader is immediately empathetic with his agony over which of his infringements have been discovered. The more arresting and compelling hook however, occurs in the Frick Art Gallery in New York. Theo's Mother decides to kill time before the appointment doing something she loves: exploring art galleries. A particular painting, The Goldfinch by Fabritius was being exhibited and she particularly wanted to see it. It is evident from the title that the painting will have far-reaching significance and this begins when a bomb is detonated in the gallery. Trapped and separated from his Mother, he forms a crucial bond with a dying man that leads to Theo taking the painting from the debris. This act reverberates through the rest of his story and can be seen to be a fundamental link to his Mother and a central pivot around which his development turns. This book is long: after listening to the opening chapters, I bought the novel on my Kindle and switched to reading. I like audio, but even when I listen to certain sections whilst cooking, if it is a book I am invested in then I re-read the pieces I have already heard. This won't be the same for everyone, but I am essentially a kinaesthetic learner and auditory processing is my weakest area of retention. So, with my Kindle noting 868 pages, I was grateful that the hours were per chapter rather than per the novel as a whole! And because this is so long, it needs to be read with momentum. I don't advocate racing through a book, but a steady reading rhythm will make even the thinnest of plots have more resonance. A story needs to be told, and weekly episodes do very few novels the justice they deserve. And so back to Theo Decker. This is a bildungsroman told in the first person and spans his life from thirteen to his mid-twenties. The voice is thus youthful and at times, naive. There is an essential goodness about Theo and I found myself hoping that the denouement would move him from a Pawn to at least a Knight in his own game. Motherless in a family where the Father had long gone and any Grandparents had surrendered interest years ago, he begins as a victim. Cornered by well-meaning social services, Theo blurts out the name of a family whose son had been a friend in Elementary School, and so he begins his life post-Frick-explosion with the Barbours. It is a story that is difficult to predict, and it sweeps the reader with a wide narrative arc that moves from New York to Las Vegas back to New York and then to Amsterdam. In every episode of Theo's life he makes friends or has a significant character who is important to him, but he remains essentially alone. At one point in the story he takes a long and lonely bus journey, and this, for me, perhaps more than the at-times contrived metaphor with The Goldfinch, summed up his character. The book spans Theo's maturation: it is perhaps inevitable that with his background and the influence of those around him, he will find drugs, alcohol and intensity of friendship that eclipses sense. But the central relationship with Boris always has some tenderness at its heart. In his fearlessness Boris retains a primitive affection for Theo which means that readers always tolerate him even when they see his influence over the protagonist is not good. 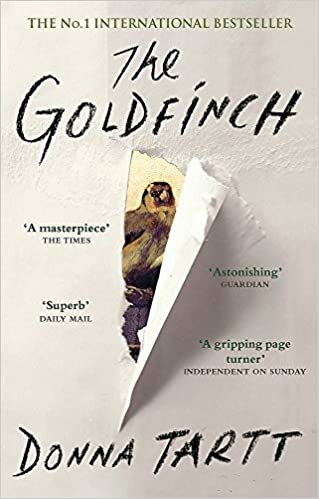 Their relationship is in some jeopardy in the final stages of the novel, but I won't give any spoilers to the ending just in case there are any of my readers who, like me, have come very late to The Goldfinch party. There are two delightful characters who resonated fully with me: Welty, whose dialogue takes place over only a very small number of pages, and his business partner and friend, Hobie. These old men are, like the antiques they restore, from a bygone age of trust, simplicity and mutual respect. They act as ballast in the storm of Theo's life and they are a simple juxtaposition to the seedy and tortured worlds of drugs, gambling and crime that become Theo's normality in Vegas and beyond. Alongside this cast of characters there are female figures. The most important remains Theo's mother who represents love and stability; a safe place. It is made clear from the outset that her death changed everything for Theo. Indeed, very early on in the novel he states, "It would have been better if she had lived." But despite her absence being her very presence in the novel, Tartt rightly creates other female characters for Theo. These are not as fully realised as any of the male characters, though Pippa, despite a certain aura of mystery, is the most tangible. This novel is acclaimed: it won the Pulitzer prize for Fiction in 2014 and the Andrew Carnegie Medal for Excellence in Fiction. But it is not without its critics. I really enjoyed the book. I was convinced by the protagonist and though I resisted some of the changes of scene and significant characters at different points, I found each element of the novel compelling. Some have said that it is not well-written and is overly dependant on cliche. This I don't agree with. What I found challenging was the persistent metaphor of life and art. This is fully expounded in the closing chapter and reads almost as a philosophical essay on the subject. This seems to have been the authorial purpose to the novel as a whole, but Tartt created Theo Decker in order to provide a context for the viewpoint. I prefer to remain character-centrist and see the purpose of the story as one of self-discovery. Integral to Theo understanding himself is his attachment to the picture. But I doubt he would have formed such an affinity with The Goldfinch had it not been for its associations with his Mother. There is no doubt however, that Tartt evokes the painting well. I was certainly curious to see it online and would be very happy to encounter it in a gallery and see it for real. So here, she truly succeeds. She awakens our artistic curiosity and perhaps encourages readers to experience art in a way that they have not considered before. Comparisons have been made between this novel and the style of Charles Dickens. I can see that Tartt writes at length, but her detail is not in the description nor in evocation of mood. Instead, I found myself comparing more with the episodic nature of Jane Eyre. Whilst the bildungsroman connection is obvious, both texts do have similar blocks of story. Bronte utilises Jane's childhood, Lowood School, Thornfield, the Rivers' house and then back to Rochester. In The Goldfinch, there is the accident, the Barbours' house, Los Angeles, New York, Amsterdam and then its almost worldwide conclusion. Like Jane Eyre, each story is dependent for its context on the one that went before, but it reads almost as a series of cameos. Ultimately, Donna Tartt conveys that life is fleeting and that we have choices to make. She makes interesting assertions in defining what might be perceived to be morally good and what might be its opposite. Voicing these thoughts through Boris, Theo and Hobie at the conclusion of the novel makes the viewpoint persuasive. I really enjoyed this book. It needs to be read at a pace so that its gargantuan length doesn't put you off. I recommend the Kindle for this (or any other electronic reading device of course!) as it disguises the thickness of the spine! Having said this, I might give it a place in my physical library as I quite like the visual of all the books I have enjoyed being ranged in my shelves!